And a bonus: Get the Bobcaygeon Floor Plan featured in this article, sent straight to your inbox. What color is a log home? When it comes to wood stains, the sky’s the limit! There are a lot more options than you might think. There’s a great selection of colors in the brand of wood stain we recommend – more on that below – and we’ve seen our customers get quite creative with their choices! Like the homes featured in the video? Read on for our advice on choosing a wood stain for your home, and to get a bonus related download at the end of this post! There are so many options out there for wood stain brands, but when it comes down to it we always recommend Sikkens. 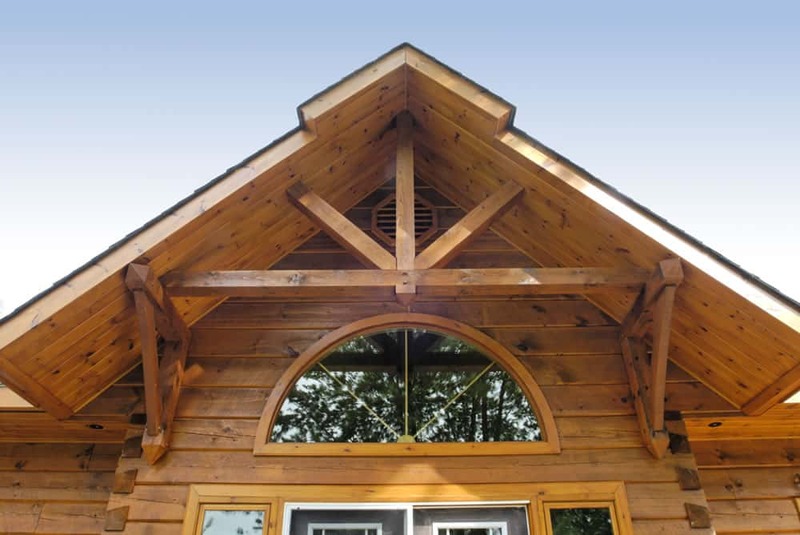 In our experience in building log homes, Sikkens are the best stains that money can buy. We’ve had amazing luck with their durability and ability to prevent the weathering of the wood and maintain its condition for years. We’ve found that with Sikkens stains, you only have to restain about every 5 to 10 years, depending on exposure, sun and other conditions. Other stains may only last a couple of years. Of course, in the end it’s 100% your choice – it’s your custom home, after all! You don’t have to use Sikkens stains. But we highly recommend it! There’s something uniquely beautiful about the natural look of wood, and using a stain instead of paint allows the natural characteristics of the wood grain to show through, while still giving some color and personality to your home. This image shows how the stain colors look on the wood we’ll use for your log home. Note that the color may appear different depending on the monitor you’re using. It’s really best to see it in person – you can do so at one of our seminars. Choosing a lighter colored stain for your home gives the wood a brighter, more natural look that’s sunny and uplifting. On the exterior or interior, lighter colors can make your home seem bigger and more open. A rich dark color, such as the 072 Butternut and 009 Dark Oak stain colors above, will give a warm, cozy and intimate feel to a home, and make a large room look smaller. You don’t have to choose just one color! We’ve found that the two-tone look, like on Rich’s house, is becoming more and more popular. Rich Kinsman from Confederation Log & Timber Frame chose a two-tone burgundy and natural wood stain for his home. By mixing and matching wood stains, you can create interest and depth. You might go with the lighter color throughout with dark or burgundy accents, like Rich, or you can choose to go with darker colors that are brightened up by lighter accents. When thinking about what colors and what look you want, think about your personal preferences and homes that you’ve admired in the past. Start saving images and photos of colors and effects that you like. For the interior, consider the feeling that you want in that space. Do you want it to feel open and airy, or more cozy and intimate? Don’t forget to take into account your furniture and decor. You may not want dark wood on the interior if all your decor and furniture is also dark. Contrast is key. When designing your custom log home, we’ll create a 3D walkthrough of your home so you can see what your colors will look like in real life. At that stage, you have plenty of time to plan your color schemes and change your mind if the effect is different than you imagined. Now, for your free bonus! In the Marc & Mandy Show video above, Rich and Evelyn admire the huge windows of the Bobcaygeon home. Now, you can download the Bobcaygeon floor plan for free! Use it to inspire yourself and get ideas for your own dream home design – whatever color it may be.